This time of year, when the weather is nasty further north in the hemisphere and the weather is more bearable down here near the equator, Tawn and I find ourselves with an endless stream of visitors. We were fortunate this week to have a pair of unexpected, but very welcome visitors: Jason and his husband Daniel. Jason and I have known each other for a number of years through Xanga but this is the first time we’ve met in person. 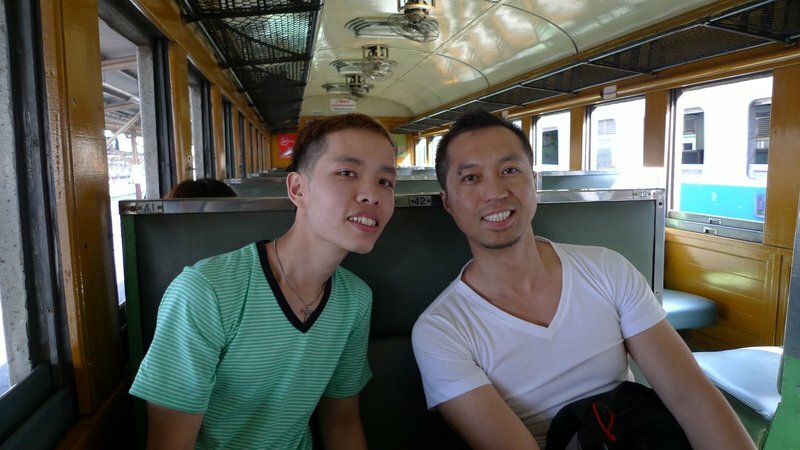 We began our multi-modal journey at the Art Deco style Hua Lamphong railway station, located on the edge of the old city. The misters along the roof were going full-blast, trying to cool down what was a sunny and warm day. 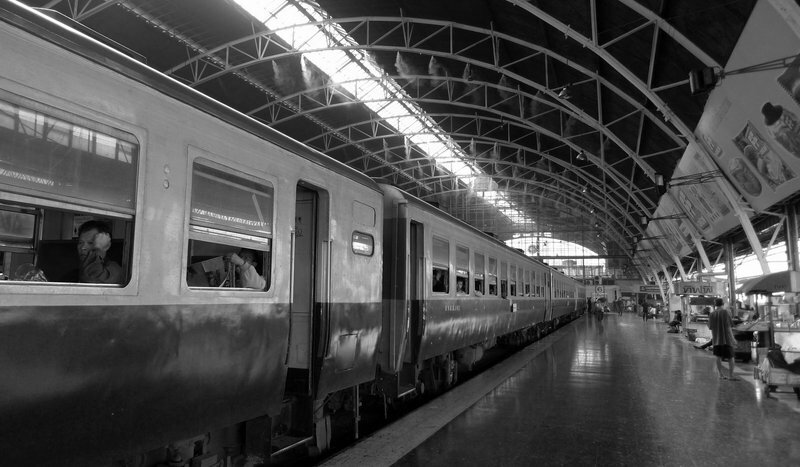 Our journey through the city by rail was only twenty minutes long but it gave us a chance to view a different side of Bangkok life. The train cars are not air conditioned and are older than any of the three of us. Here, Jason and Daniel wait for the train to pull out of the station. 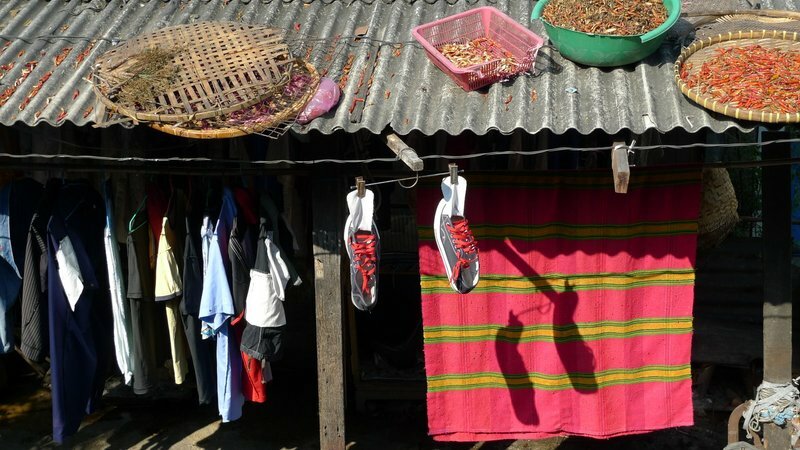 At one of the stops along the way, I noticed these shoes, sheets, clothes, and chilies that were being dried in the sun. It reminds me of that long-lost Tennessee Williams play, “Chili on a Hot Tin Roof”. Some of what you see along the train tracks verges on squalor and sadness. This man was squatting barefoot on a wooden shack, a guitar at his side and a vacant expression in his eyes. From the train we transferred to a canal taxi, racing through the polluted khlong to the end of the line, which is adjacent to the Golden Mount. From there we squeezed into a tuk tuk, a three-wheeled taxi, and weaved through the traffic to Thammasat University, located on the banks of the Chao Phraya River. 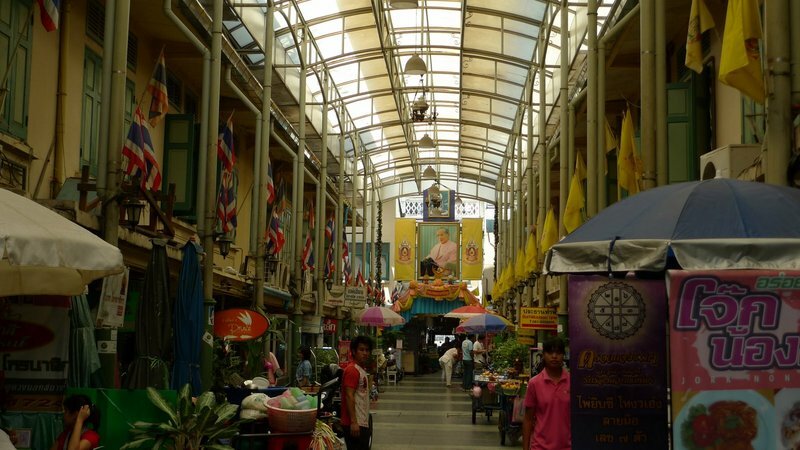 A short walk down the street from the university was this hidden soi – an alley of antique shop houses that has been roofed in. It is well-ventilated and almost looks like something out of the French Quarter in New Orleans, minus the picture of His Majesty the King. After lunch we walked a bit further down the street to the Grand Palace. 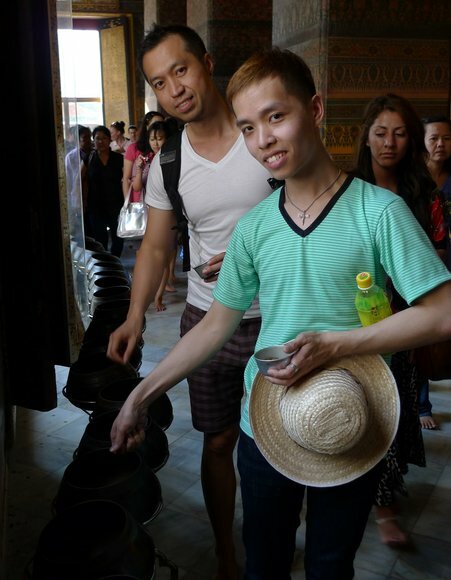 Here are Daniel and Jason in front of a trio of buildings in Wat Phra Gaew, the Temple of the Emerald Buddha. This is His Majesty’s personal temple and is the only temple in Thailand that does not have monks’ residences on site. The three structures in the background are, from left to right, a Sri Lankan style chedi (or stupa) that contains relics of the Buddha; a Lanna (Northern Thai/Laotian kingdom) style library that houses Buddhist scriptures written on palm leaves; and a Khmer (Cambodian) style hall that contains statues of the eight previous kings in the Chakri dynasty. A rehabilitation of the last building was just completed in the previous few days and workers were taking down the last of the scaffolding. 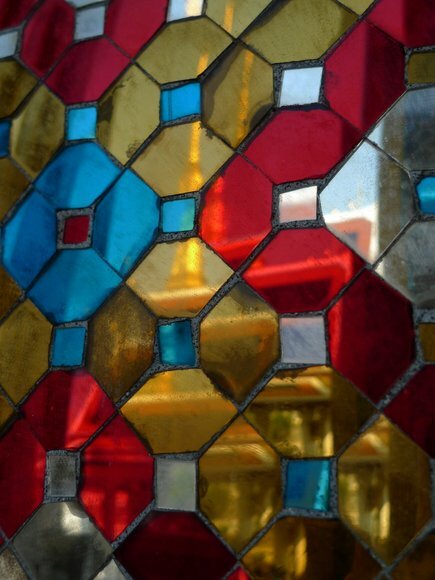 I was trying to be artsy with this photo, taking a picture of the reflection of a wihan – a Buddha statue hall – in the mirrored mosaic tiles of the Chapel of the Emerald Buddha. My attempts to focus on the reflection failed but I think the result is still interesting. A common theme that we observed, which I hadn’t been aware of previously, is how much Chinese statuary there is on the grounds of the temple. This is a fine example of a traditional Chinese gate, carved in miniature, with the Buddhist scripture library in the background. Throughout the complex we saw warriors, pagodas, gates, lions, and other sculptures in the Chinese style. Later in the afternoon we walked down the street to Wat Pho, the Temple of the Reclining Buddha. 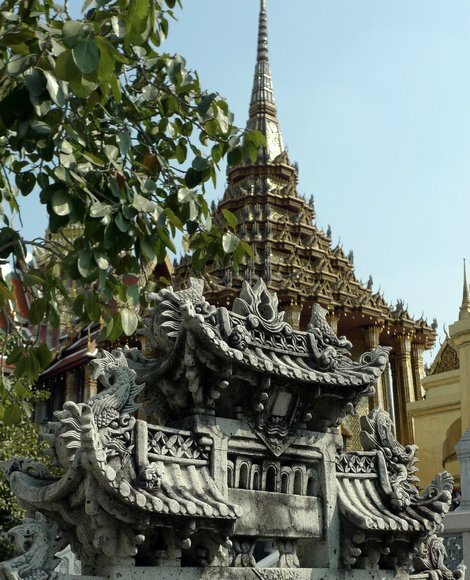 This temple is dotted with dozens of chedis large and small, which contain relics of various major and minor members of the royal family stretching back more than 200 years. I cropped this photo from a larger one as I thought it made for an interesting silhouette. Sure enough, as is always the case, on the way there a half-dozen different people intercepted us and tried to tell us that the temple was closed. (It is open every day until at least 6:00 pm – actually, I think it is staying open until 9:00 pm these days.) This is a classic Bangkok scam. Do not trust strangers who approach you. 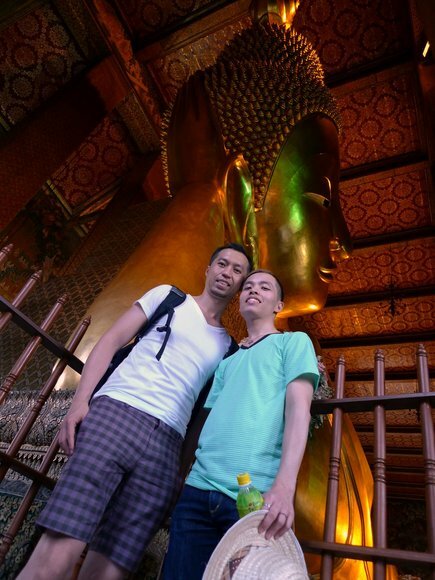 Daniel and Jason in front of the Reclining Buddha, which is 46 meters long and 15 meters high. In answer to a frequent question, the statue was built first and then the hall was built around it. 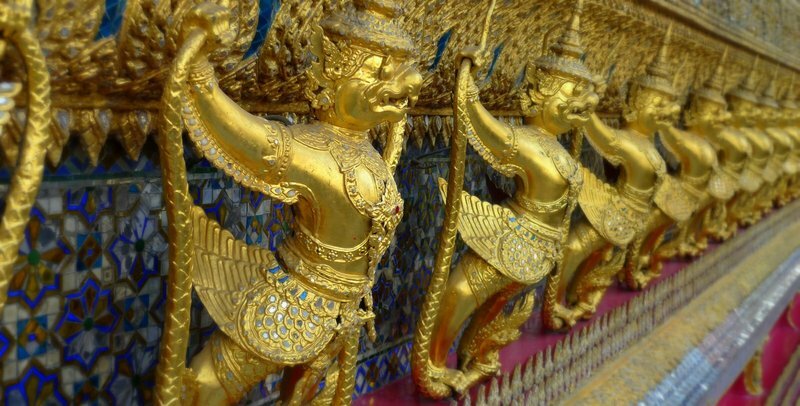 A popular activity is to donate 20 baht for a cup of small coins, and to drop them into a row of alms bowls, reciting a prayer or giving thanks for a specific blessing as you drop each coin. This picture of Daniel and Jason turned out very nicely, I think. Nice lighting and composition. This temple is one that tourists tend to miss large portions of. They see the giant reclining Buddha statue and then depart. It is a very large temple, though, and has many areas well worth a look. As we wandered around the quieter portions of the temple, we came across a gardener who was trimming some bushes. 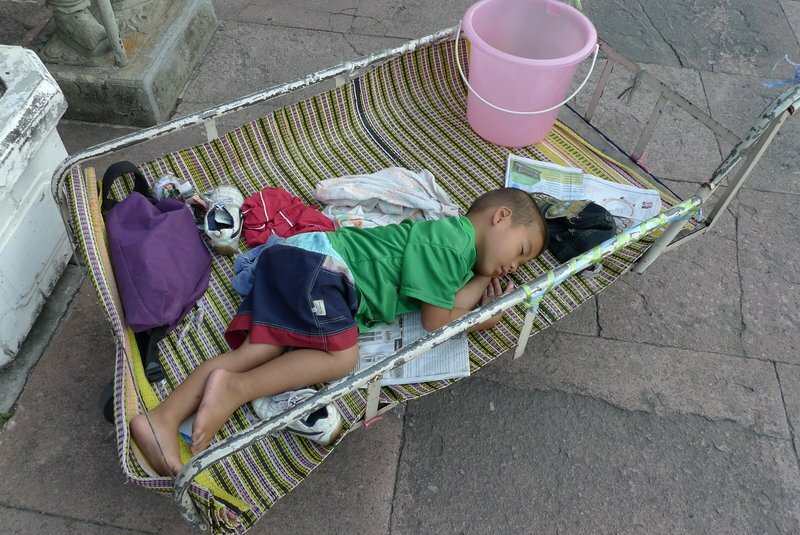 His son was conked out nearby, taking a nap on the utility cart. How I wish I could sleep so easily! After a warm afternoon touring we decided to bypass the long queue for the river taxi and instead hire our own long-tail boat. A little hard bargaining (and a willingness to walk away when my desired price wasn’t met) resulted in the dock manager coming back to me as we sat drinking our water and finally accepting my price. What a nice way to catch a breeze and work our way downriver. That evening Tawn joined as the four of us had dinner at Soul Food Mahanakorn. Of course we were so caught up in conversation that we forgot to take a picture together! This entry was posted in Uncategorized and tagged Bangkok, Buddha, Daniel, Jason, Temple, Thailand, Tourist, train, travel, Visitor, Wat, Wat Pho, Wat Phra Gaew, xanga, Xangans by christao408. Bookmark the permalink. Thank you for sharing this. I will probably never make it there but I have a taste of Bangkok after reading your post. How nice!How does the scam work by telling you the temple is closed? Thanks for sharing. Good to see Jason and Daniel together. Don’t know much about Daniel, but Jason seems like a decent guy (FEED HIM, looks way too skinny) and his band sounds remarkably good. Happy new year, Chris. Everytime you post photos I see something new! I am now of the opinion that to really see the sights I would have to make multiple visits since there is so much detail! Thanks for the tour – and hope your visit with friends is exceedingly delightful! Awesome! 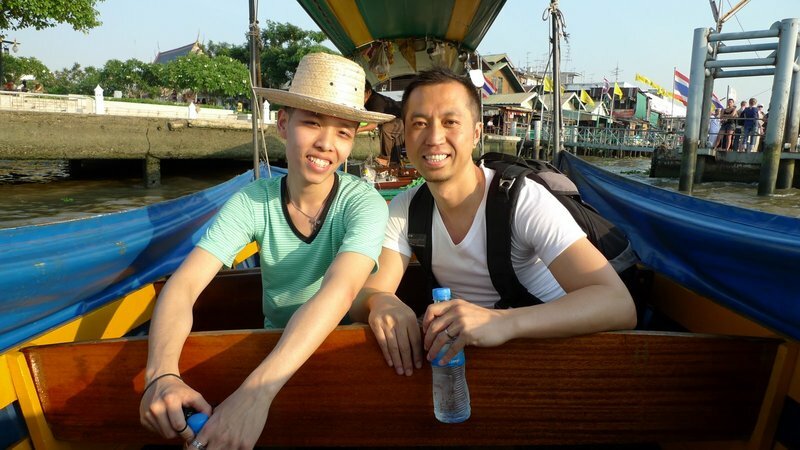 Now I want to visit Thailand :PI’m curious about how the scam works, too! I don’t understand the scam. Why do people try to lure you away from the temple? You know I would love to visit! @yang1815 – they try to persuade you to visit someplace else, usually a gem factory. Once you’ve been taken there, they’ll try to sell you jewelry and gems. They are very persuasive and can be very low key. @ElusiveWords – Ooo I see. Thanks for the explanation. It’s Jason and Daniel! It’s awesome seeing fellow Xangans get together especially half way around the world. I love the pics and appreciate the time you’ve taken to compose and edit them. I’m looking forward to reading part 2. You’re such a nice host!!! I agree, you are a great host! Kudos to you, Chris. And, wow, that’s Jason and Daniel! I didn’t know they were married! :-O This is awesome and cool. Once again, a fabulous photo journey, Chris! Particularly great for me to see parts of the “old” city, since during my visit there 42 years ago that was probably the whole thing. I can see you have quite a photo gene! 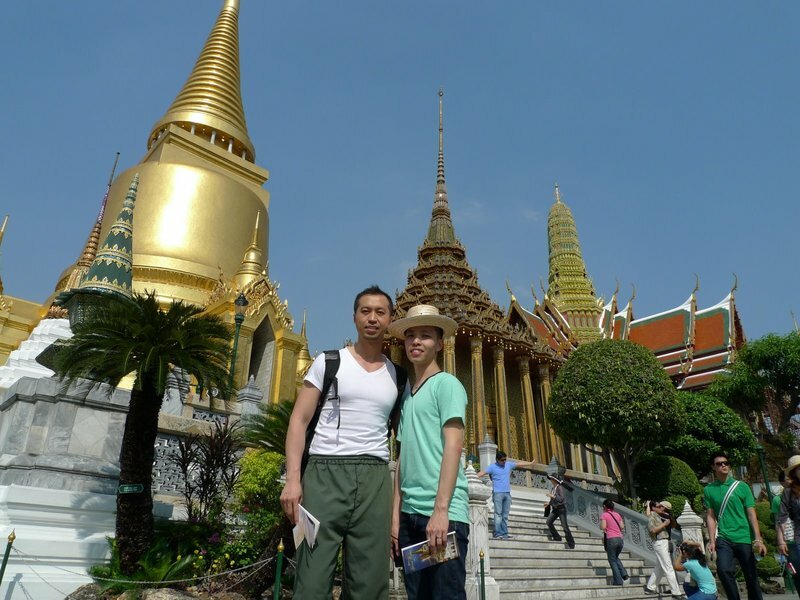 Very nice photo of the Grand Palace, especially the photo of D & J in front of the Reclining Buddha!